The course is designed to rapidly introduce participants to basic and intermediate aquatic treatment ideas for the musculoskeletal patient. It will provide an overview of treatments pertinent to pediatric, adult and geriatric practices, with an emphasis on the following musculoskeletal conditions: s/p fracture, internal trauma, sprain, strain or dislocation, s/p joint replacement (e.g. TKR), s/p tendon or ligament repair (e.g. ACL), arthritis, chronic pain syndromes (e.g. fibromyalgia), and back and neck dysfunction. Provides participants with insight into musculoskeletal-specific precautions and contraindications to immersion. 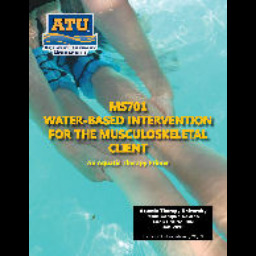 Teaches participants to justify aquatic therapy interventions to payers and referral sources. Includes an 8 hour aquatic lab of the most clinically useful elements of popular aquatic specialty techniques for the musculoskeletal population. Bio: Kara Morales MS, PT, MAq Tracks: Musculoskeletal Kara Morales MS,PT, graduated from The George Washington University in Washington, DC with a Master’s degree in Physical Therapy in 2003. Since 2005, she has worked in outpatient orthopedics for Rock Valley Physical Therapy in Moline, Illinois, one of Rock Valley’s 26 clinics in the Quad City Metro area, as well as Des Moines, Iowa and Peoria, Illinois. She spends part of her time in the clinic specializing in manual therapy techniques and also works in the pool providing one-on-one individualized patient care for orthopedic and geriatric populations. Over the last 10 years, Kara has worked to develop and expand the aquatic therapy program at Rock Valley Physical Therapy with emphasis on post surgical conditions, total joint replacements, osteoarthritis, chronic neck and back pain, fibromyalgia, shoulder pathologies and general deconditioning. Her aquatic therapy studies began through achieving the Aquatic Therapeutic Exercise Certificate through ATRI in 2007. She continued to expand her knowledge and expertise through the Aquatic Therapy University and received the first Musculoskeletal Aquaticist Credential in 2015. She is an ATU Aquaticist Instructor and the Iowa Campus Director. She is excited to share her passion for aquatics and help spread the word about this amazing specialty area through training and educating other therapists! Kara is from the Quad Cities and currently resides in Colona, IL with her husband. She has 3 sons and a granddaughter. Her hobbies include martial arts, drums and volunteering for a non-profit ministry.